Every year on March 8 it’s World PTLS Awareness Day! A perfect moment to reflect on another great year for this Dutch family, in which both our kids, especially Jelle, experienced so many developments again. ‘Blown away’ is the best description for it. We have a 13-year-old adolescent in tha house! Healthy annoyed by his parents and with a growing dislike of ‘going with our flow’ ofcourse. Staying home alone was always a huge disappointment. No matter how short it was, it just did not work. On every attempt Jelle stubbornly (and bravely) indicated that he was not coming with us to the store or bringing his brother to school. The time timer was set, instructions given for when he didn’t feel comfortable etc. Minutes after we left he would imagine that we had gone on vacation without him, he would panic and be in tears at our return. That was therefore no option. But ever since his brother went horse-riding, he stays home alone, with success! Jelle thinks that horses are no fun at all and coming along is a waste of his time: “I will NOT come anymore and stay at home without you!” And it’s going really well. He knows how to tell the time now, so two huge milestones for him! Mr Jelle now wants a mobile phone, ‘because then you do not have to worry about me, mom!’ Smart thinking! He receives 3 euros of pocket money every week. And he reminds us strictly, because we sometimes forget. Jelle had a big goal: to save money to buy a PlayStation 4. OMG, a game computer in my house? But okay, it’s your money … Our big saver (and Max Verstappen fan) has recently saved enough money to buy it with of course a Formula 1 game! What an achievement! With his brother he is now racing shoulder to shoulder in front of the TV, or Minecrafting in their self-built world. Jelle can not read (he sometimes recognizes words), but he is so very handy with every device in our house. Jelle is a happy child, and how awesome is that! He overcomes all his fears. Crying at the first visits to the orthodontist. It took so much for him getting used to several bracelets (now on his 3rd). But he now cuddles the orthodontist when he leaves, my sweet charming prince! A mind of his own, with a growing self-confidence. He gave up his dancing classes after a great dance show last April, because he wanted to play in a soccer team (and that was not suggested by us). Since last May he plays in a great G-team (G=for disabled people) at a really nice soccer club. No matter how harsh the weather is, soccer training never gets cancelled and that is a good thing for his slender body, he is getting stronger every day. He wants to take skating lessons as well and go karting to be the next Max Verstappen. This wonderfully cheerful boy who is much more than someone with the Potocki-Lupski Syndrome, he is Jelle! 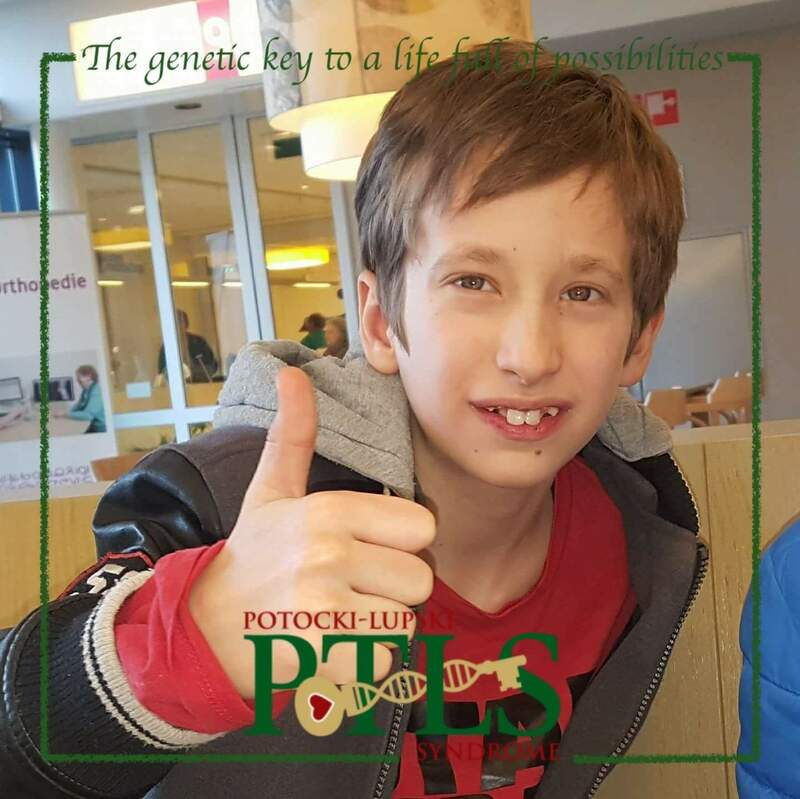 Dit bericht werd geplaatst in PTLS en getagged met Potocki-Lupski Syndrome, PTLS op 7 maart 2018 door Nafze.